The territory of Lake Garda is ideal for foodies and lovers of good wine, it is a place to taste! If you love good food, Lake Garda will not disappoint you. During your stay you will discover that our beautiful region has a lot to offer you in terms of local products and behind its enchanting views hides ancient agricultural traditions. In this short article I will talk about one of Lake Garda’s most important agricultural products: the Garda D.O.P. extra virgin olive oil. Olive oil is a symbol of Italian food and of the history of Italian cuisine. It is the core of the typical Mediterranean diet and Italy is considered the foremost producer of high quality olive oil. Olive oil, tasty and rich in nutritional properties, is perfect for the diet: thanks to its lightness it can be paired with any dish, from appetizers to desserts. Its delicate flavour goes very well with ice cream too! 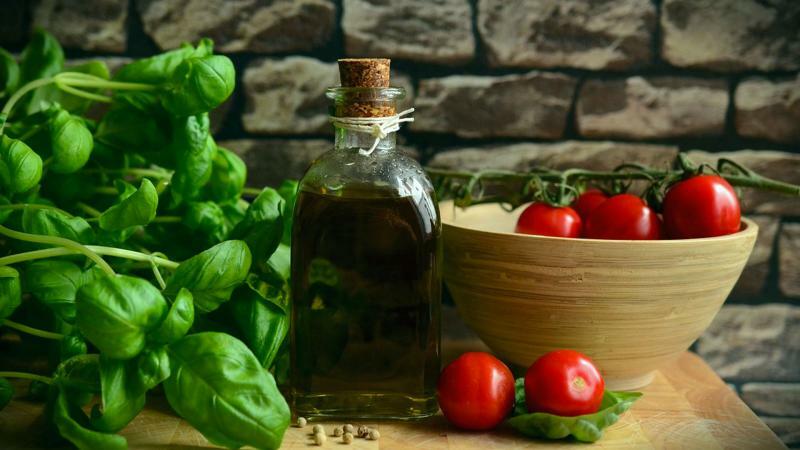 Extra-virgin olive oil is best consumed without cooking it and goes well with dishes based on lake fish, but also meat, cooked and raw vegetables. WHAT DOES "GARDA D.O.P. OLIVE OIL MEAN? In 1997 the Extra Virgin Olive Oil Garda obtained from the European Union the recognition of the Protected Designation of Origin (D.O.P.). The D.O.P. certification is a quality label that is attributed to a food product, whose production and quality characteristics are closely linked to the territory of origin. A food that receives the D.O.P certification is a unique and inimitable product, protected against counterfeiting throughout the European Union. Garda D.O.P is therefore an olive oil produced with local olives, transformed with knowledge and processing techniques that are unique to the territory of origin. This means that it is a certain geographical environment that determines the oil identity. To obtain the D.O.P. certification the olive oil producer must also comply with a set of precise rules and submit to strict controls. The olive tree is also a natural ornament of the Garda landscape and symbol of a strong territorial identity. Its roots go back to a remote past: already in roman times it had developed a thriving and appreciated olive oil production in the area of Lake Garda. And even in the successive historical periods the plant was always held in high esteem. The olive tree cultivation for the production of oil has always been important to the local population and the agricultural economy: it represented a significant export product and it often served as a medium of exchange. The locally owned olive oil farms that dedicate themselves to this production are increasing on the territory of the lake but the oil is still produced with the care and attention of the past. Some of the same groves and estates of Italy have been producing olive oil for hundreds of years, continuing a time-honoured family tradition, appreciated throughout the entire world. In our increasingly homogeneous world, there is something extremely satisfying about buying something that has been grown, produced or lovingly hand crafted by someone within one’s own community, don't you agree? At our Panoramic Bar you can enjoy local olive oil served over fresh salads, caprese salads and other dishes. But that's not all because in your room you will find a courtesy set based on biological virgin olive oil, which has great emollient and softening properties. For more info and tips to buy local olive oil ask at the reception or at the Panoramic Bar.